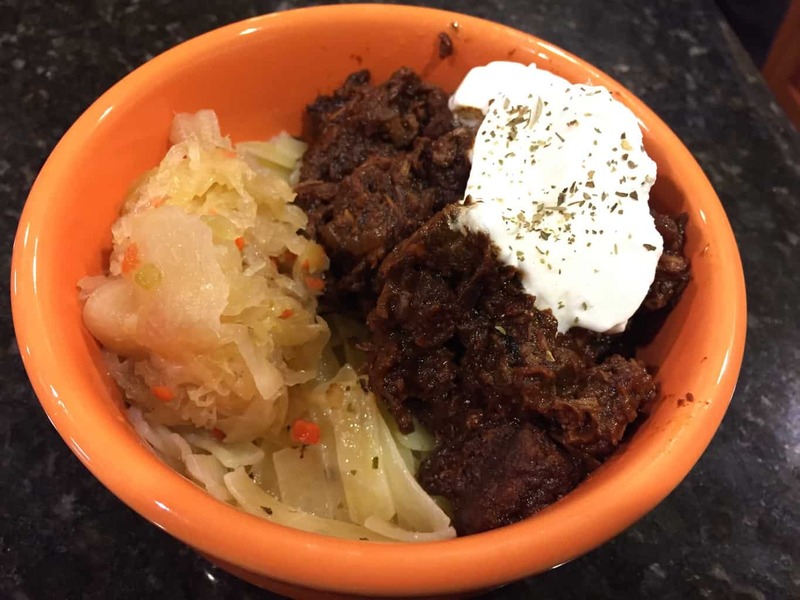 I like to pretend it’s my Hungarian heritage that draws me to to this dish, but the truth is I love stews of all kinds, at any time of year. This braised dish sits on the back of the stove for a few hours, filling your house with the scent of paprika and yumminess. Oh, and it’s effortless to make this dish gluten free! To offset the heat of the paprika, the recipe uses a bunch of onion. These cook down into the sauce to add a rich sweetness that will have you reaching for second before you realize it! My recipe calls for a thick sauce that clings to the beef, but if you like a looser, soupier sauce, that is fine. The sauce will soak into buttered noodles, rice, or even gluten-free rolls. If there’s one thing I miss about my pre-gluten-free days, it’s going out for Chinese food. Sure, even then, I could make it for myself, but there’s something about the way restaurants prepare the food that had me going back, time and again. Yeah, that’s generally a solid clue what I ordered wasn’t the most healthy choice on the menu. Except when I ordered beef with broccoli. Done right, it’s a fairly healthy dish. And, it turns out, it’s so easy to make at home. Which is perfect for those times when I want to treat myself with my favorite food! While you may not have heard of larb by that name, you are likely familiar with the variation known as “lettuce cups”. Lettuce cups often feature Chinese flavors while larb tends to be spicier, with flavors of Thailand and Laos. 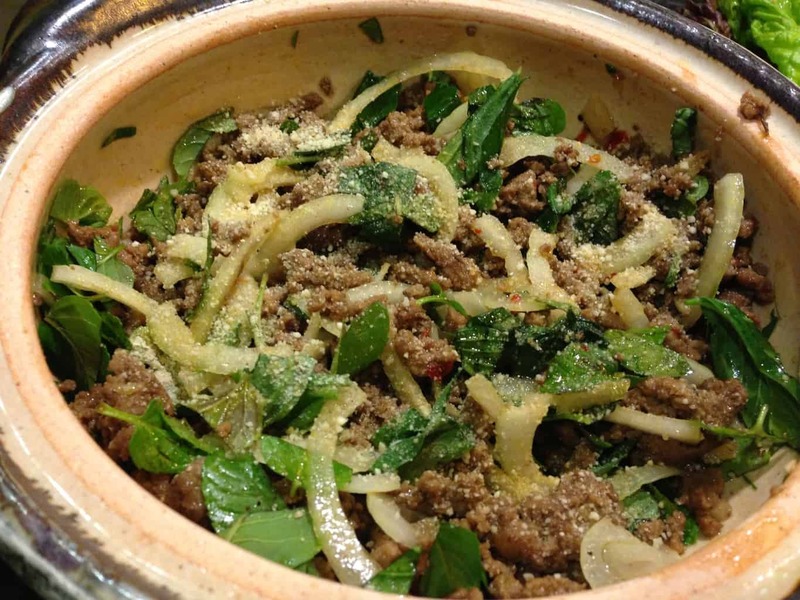 This ground meat dish features lime juice, fish sauce, chiles, and herbs. You can use any type of ground meat, though chicken seems to be the most traditional. Serve in lettuce cups and make a little extra sauce for spooning over the completed dish if you’d like. Once interesting ingredient in this dish is ground toasted rice. It can be optional, but the rice powder adds a bit of crunchiness that is surprising, so I suggest going for it. You can toast the rice on the stove, but I prefer the oven method because it’s less hands-on — I do all the other meal prep while the rice is browning away! I grew up eating really bad meatloaf — it was dry and covered with ketchup. Yet I still loved the stuff. I love it even more now that I’m an adult because, as with many of the foods from my childhood, I’ve discovered and refined recipes that suit my more adventurous tastes. But I admit it: I still frequently use a variation on the traditional ketchup glaze. Traditional meatloaves are made with a bread-and-milk panade. Unless you’re doing a lot of gluten-free baking, chances are you don’t have much GF bread to spare. Another option is gluten-free breadcrumbs, or…you can do as I do and use meaty, tasty mushrooms to your meatloaf. In addition to adding incredible flavor, mushrooms help keep your meatloaf moist and increases flavor. 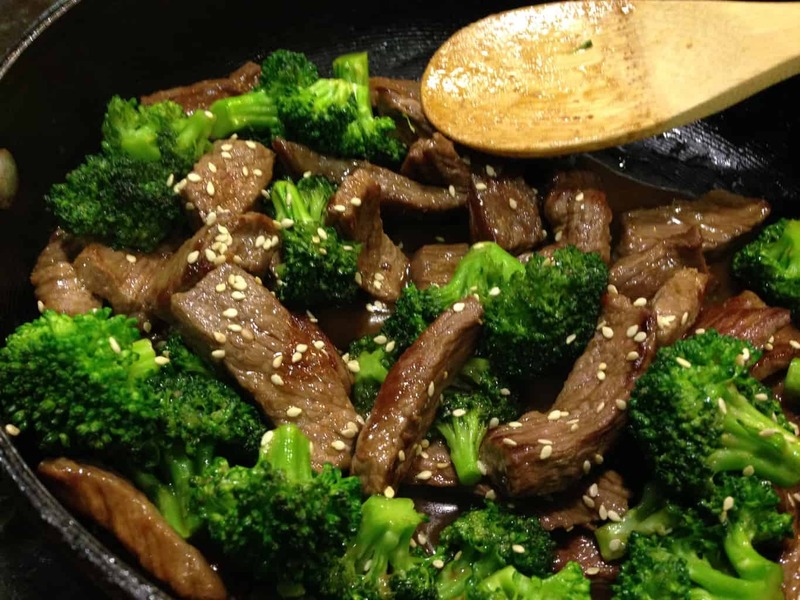 This recipe includes basic seasonings. Use them as suggestions. Fresh herbs and different spices can change up the flavor in great ways. Like heat? Add some cayenne or fresh jalapeno. I sometimes add about a 1/2 cup of shredded Parmesan cheese to my meatloaf mixture. There is no one way to make a meatloaf. One thing: while you can make your meatloaf in a loaf pan, I like this freeform style because it keeps the loaf from stewing in its juices. When the craving for chili hits, you gotta go with it. Otherwise, it haunts you. There’s nothing in the world that can be substituted. 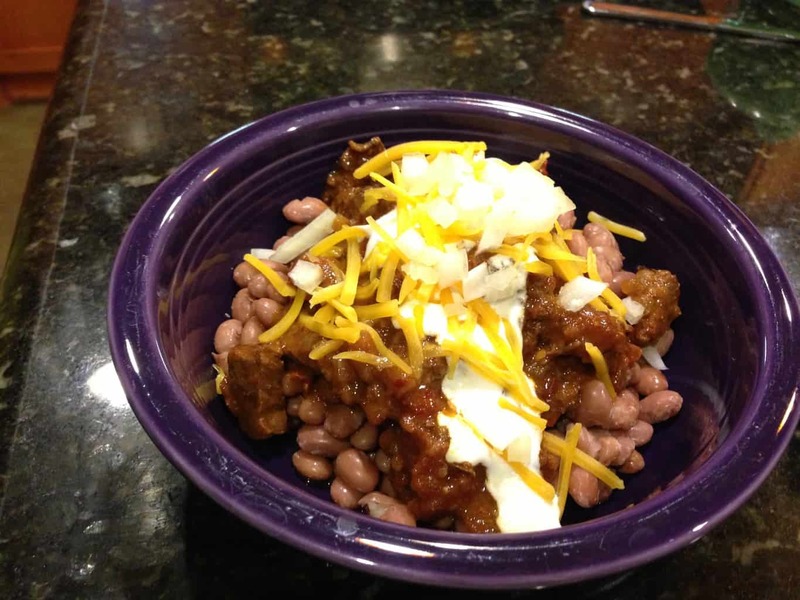 The process of making chili ranges from complex to very simple. My recipe is in the moderate range. Do a little work upfront, then let it simmer for a while. It’s very customizable (see the Notes and Meal Suggestions). This recipe calls for beef, but you can go with ground turkey (or shredded turkey). You can use pork. You can use chicken. Don’t want beans? Don’t have to have ‘em. In fact, there is only one, unbreakable rule when it comes to chili-making: do not skimp on the cumin! You can adjust this seasoning, that ingredient, but the cumin is essential. Once we were at a friend’s for a Super Bowl party. I took one sniff of his chili and knew it would be good. The cumin was right there. He seemed surprised that I knew about the cumin rule. I think he doesn’t get out enough. A note about heat. My husband loves his food very spicy. I am more of a medium, and this recipe reflects my tastes. As you review the list of ingredients, take your personal tastes into consideration. You can always start on the careful side and adjust the seasonings as you go. I love me some burgers, and — truly! 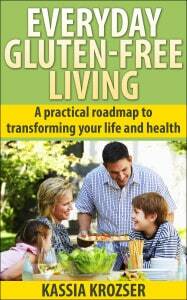 — since going gluten free, I think of burgers as jumping-off points for really fun meals. When I think back to how I felt after eating a burger with a bun (and, especially at restaurants, trying to figure out how to consumer the massive meal I was served), I realize how I don’t miss the bread. As you can see from the variations below, think of the basic burger as a canvas for tasty variations. Serve with gluten-free fries (Tater Tots are GF!) or mashed potatoes or a green salad. Or any salad you like. Burgers are quick and easy weeknight meals. Condiments can range from the traditional ketchup, mayonnaise, and mustard to pesto sauce or salsa. Add your favorite cheese, if cheese is your thing. Basic Cheeseburger: Burger. Cheese. Oh, and whatever else floats your boat. Include the condiment(s) of your choice. Serve on a bed of shredded lettuce or baby lettuce mix. Bacon Cheeseburger: Top your Basic Cheeseburger with two slices of fried bacon and grilled onions. Promise yourself you’ll go to the gym in the morning. Make this even more decadent by drizzling gluten-free barbecue sauce over the whole thing. Avocado Burger: Yes, this is as simple as it sounds. Top the Basic Cheeseburger with sliced fresh avocado. Or guacamole, if you prefer. You can make a light avocado salad with cubed avocado, diced tomatoes, diced onion, and a bit of lemon juice. Add a little salt and pepper and you have an elegant topping for a burger! Serve on a bed of shredded lettuce. Skip the cheese if you want. Ain’t nobody judging your burger. Goat Cheese, Spinach, and Pesto Burger: Prepare your basic burger. Serve on a bed of freshly chopped or wilted spinach. Top with a tablespoon or so of pesto sauce. Finish with a dollop of goat’s cheese. For extra credit, if you have extra roasted garlic around the house (hey, you might! 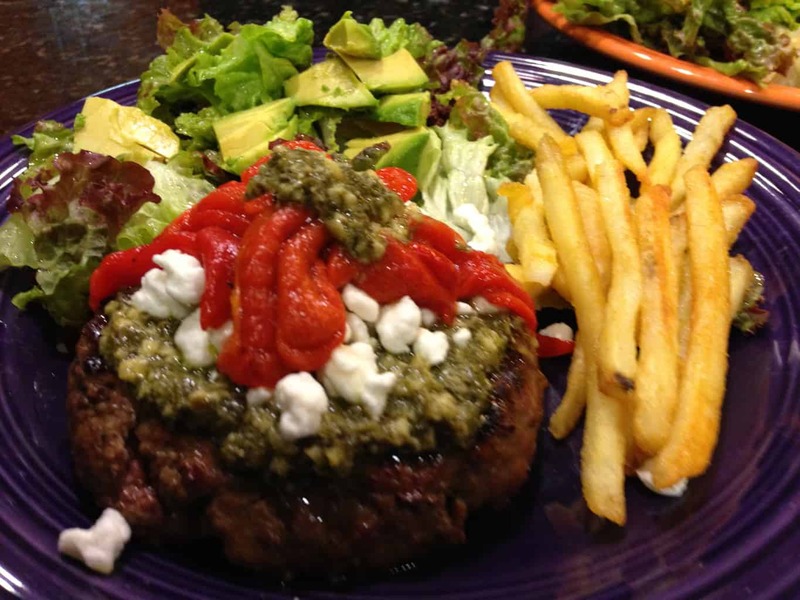 ), spread a thin layer of garlic over the burger before adding the pesto. Note: carmelized onions also work very well with this combination. So do roasted red peppers. If you want to gussy up your spinach, lightly dress it with a vinaigrette. Huevos Rancheros Burger: Have I mentioned my love of Huevos Rancheros? No? Hmm, you need to read more of my recipes! Seriously, this traditional Mexican breakfast dish can be adapted to just about any meal you can imagine. In this incarnation, the burger takes the place of the tortilla, and the rest of the ingredients are layered on top of the meat. Start with a few spoonfuls of tomatillo salsa on your plate (I prefer the tanginess of tomatillo, but if you’re a tomato salsa person, go your own way). Add the burger, with or without melted cheese (a pepper jack is perfect here). Top with a fried egg and sliced avocado. Finally, drizzle more salsa over the top. Serve with fries, tortilla chips, or even refried beans (heck, if you have leftover refried beans, you can substitute them as the base for your Huevos Ranchero burger). Mediterranean Burger: Top your basic burger with a salsa of chopped tomatoes and cucumber. Sprinkle crumbled feta cheese over the top. Serve over a green salad lightly dressed with a lemony vinaigrette dressing. Tomato-Cucumber Salsa: Chop the tomatoes and cucumbers (use a seedless English cucumber if available), season with salt and freshly ground pepper. If you like red onion, add some into the mix. For added flavor, mix in a teaspoon of chopped fresh mint and 1/2 teaspoon of fresh thyme leaves. Let the flavors marinate together at room temperature while you make the rest of the meal. Smash Burger: I like a smash burger when I’m grilling indoors. The concept is simple: instead of forming patties in advance, place balls of ground beef — about four ounces each — onto a hot grill. Let sizzle a minute and then smash down with your spatula to form a thin patty. Season with salt and pepper and cook until done. Only flip once during cooking. Add your favorite fast-melting cheese. 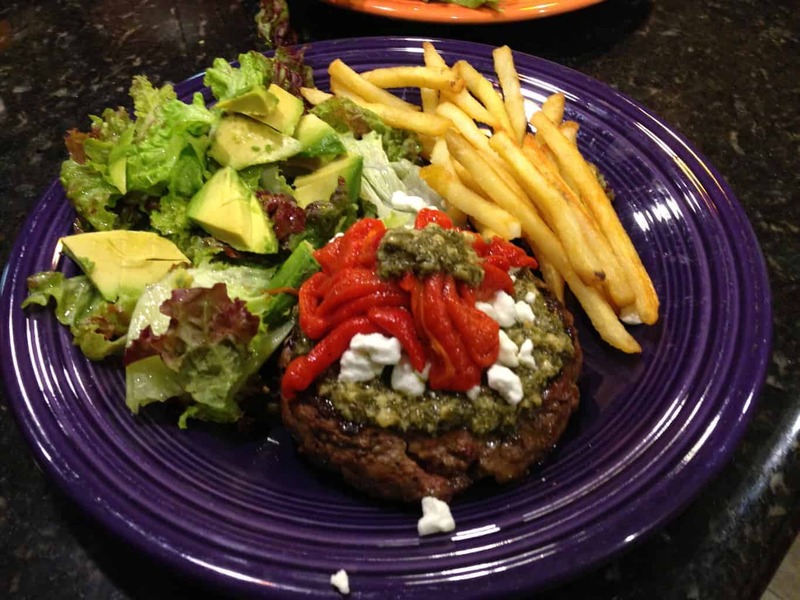 Author Kassia KrozserPosted on May 12, 2013 December 29, 2016 Categories BeefTags avocado, bacon, cheese, cucumber, egg, feta, goat cheese, ground beef, hamburger, pesto, recipe, salsa, spinach, tomatoesLeave a comment on Bunless Burger Bonanza! It doesn’t take much to convince me to grill burgers. They’re perfect for weeknight meals, weekend barbecues, and even parties. I usually enjoy my burgers without a bun, unless I’ve splurged on gluten-free buns. But the longer I go without adding breads of any kind to my meals, the less I am inclined to add the bun. I make up for this lack with lots of interesting, and sometimes unusual, toppings. It all starts with the basic burger, a recipe I think should be part of every cook’s repertoire. This bare-bones recipe results in a delicious burger every time. And, of course, modifying this recipe to suit your own taste and cravings is as easy as opening your pantry and adding different elements.